In November 2003, our client – a 36 year-old woman named Christina – was driving in the westbound lanes of Interstate 90, about 2 miles west of Cle Elum when she was injured in an accident with a motor home. Her husband was riding in the front passenger seat. The defendant was driving her vehicle in the adjacent lane but 3 to 4 car lengths ahead. The defendant then suddenly changed lanes in front of our client, causing her to lose control, spin 180 degrees and come to a stop sideways in the middle lane. Following behind was a 33-foot motor home towing a Jeep truck. 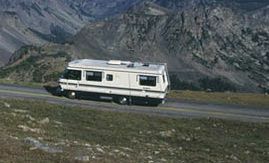 The motor home could not stop in time and T-boned Christina’s vehicle, sending it spinning back into the cement barrier. Christina suffered significant injuries to the back and neck regions of her spine as a direct result of the collision. An MRI later revealed a protruding disc at C5-6 as well as kyphosis, a painful condition that leads to an abnormal curving of the spine. Christina could not return to work as a self-employed housekeeper. She incurred medical expenses of approximately $23,000 over a 3-year period related to the injuries she suffered in the collision. The defendant was insured by Allstate Insurance Company. Allstate's lawyer denied that the defendant was responsible for causing the collision and claimed that a trucker moved into her lane, causing the defendant to make an emergency lane change into our client's lane. Upon interviewing the driver of the motor home, attorney Chris Davis was able to determine that the defendant made an abrupt lane change without being forced over by the truck. Mr. Davis also took the deposition of the Washington State Patrol Trooper who investigated the collision, who stated that truck driver had nothing to do with causing the collision and that the defendant was solely to blame. Allstate still refused to concede liability, thereby forcing Mr. Davis to take the case to trial. Before a lawsuit was filed, Christina was willing to accept $25,000 to settle her claim, but Allstate refused. Several months after filing suit, our client again offered to accept $25,000 to settle her claim. Allstate refused again. The jury found that the defendant was 100% responsible for causing the accident and rejected her claim that the truck driver was at fault. The jury's verdict was for $379,664. The judge then awarded attorney fees and expenses of $107,887, bringing the total verdict to $487,550. Christina was injured after a driver cut her off on I-90 and she was hit by a large motor home. Allstate denied the claim, but a jury awarded $487,550 to the plaintiff after attorney Chris Davis proved defendant's liability.